This book is about how to heal chronic Lyme disease without drugs using Frequency and Bioenergetic (FAB) Medicine. I sincerely hope it will help you, your family, friends or patients who may be suffering from this and other horrendous diseases. The World Health Organization (WHO) says: “New resistance mechanisms are emerging and spreading globally, threatening our ability to treat common infectious diseases, resulting in prolonged illness, disability and death. AMR is an increasingly serious threat to global public health that requires action across all government sectors and society”. Now, you can embrace a new paradigm of health and learn how photons, electrons, electromagnetism, water, cellular voltage and negative ions all feed into the living matrix of vital energy, cells and tissues that make up our body. Read what Paulette Agnew had to learn the hard way, and use her simple wellness principles. It will help you to understand what’s making millions sick, and you’ll find out how to save thousands on future medical bills. Paulette’s research over three years has led her to meet and interview many fascinating, talented and effective healers, including a leading heart surgeon in Dubai who invented his own scalar wave device; a Russian scientist, known in the Guinness Book of Records as The Magnet Man; an Italian GP specialising in ozone, and a Belgian homoeopath working with Informational Medicine and healing through Quantum Holograms. Collectively this book holds many lifetimes of wisdom, and each paragraph is packed with valuable information. It’s all explained here – simply, scientifically, with humour and honesty. What you read here will change your life and the lives of your loved ones forever! If you want to live longer, healthier and recover from all kinds of illnesses, read this book and you’ll learn how to stay in top form, avoid burnout and beat chronic fatigue. 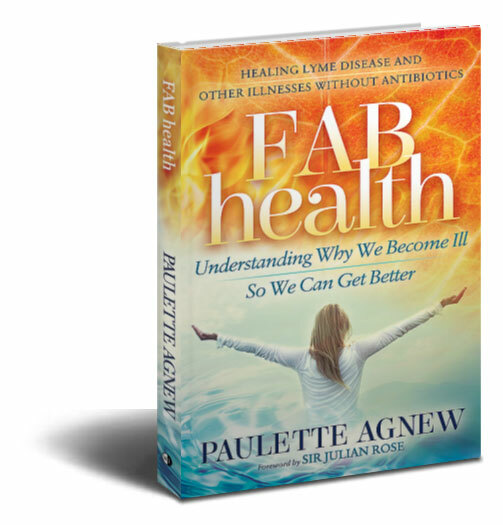 Paulette Agnew: Following her 12-year battle with chronic Lyme disease, leading to paralysis and a close shave with death, she is now completely healthy again. Paulette has now set her sights on sharing these exciting and little-known new solutions and emerging paradigm with the whole world.